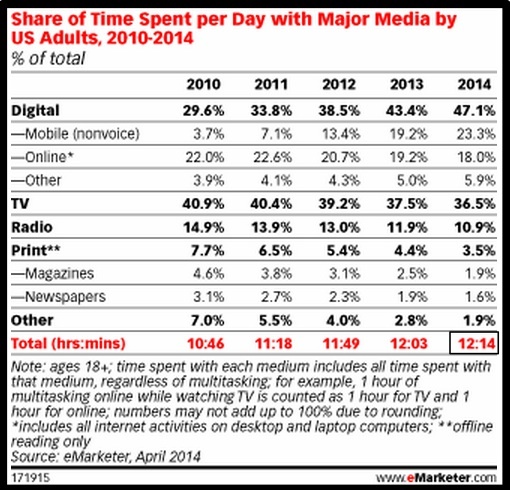 Americans spend a whopping 12¼ hours per day with media on average according to eMarketer projections, up 1.5% from 2013, a smaller amount of growth than 2012. That’s roughly three-fourths of a person’s waking hours due to how we consume content now. As Mark Schaefer pointed out, there’s an upper bound to content consumption. It’s limited by time and the individual’s ability to take in information. But what’s critical for marketers using social media and content marketing is that consumers want the content they choose on the device of their choice when they want it. 2013 was the tipping point for total digital consumption; it surpassed television viewing. Mobile is driving digital growth in 2014 while nibbling away at all other media consumption regardless of content format. Consumers spend 2 hours 51 minutes of an average day on their mobile device (excluding voice calls). Consumers spend 2 hours 12 minutes of an average day on their PC. What This Means For Marketers: Expect content consumption to continue to shift to mobile devices since they’re always within arm’s reach. As a result, there’ll be a blurring between personal and professional communications including social media and content marketing as people snack and multitask more. Actionable Marketing Tip: Make sure your content is mobile-friendly. This means the following owned media must render well and be useable on mobile devices, including both smartphones and tablets. Television time via a TV has remained relatively flat aided by the increase in new TV shows and the use of social media to engage viewers in real time. 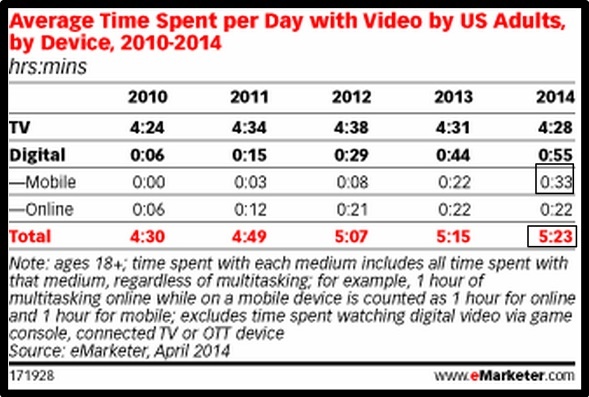 TV accounts for 36.5% of total time spent with media in 2014 compared with 23.3% for mobile. Consumers prefer renting content to buying it; shifting the content distribution and monetization model to higher volume, lower revenue rental models. Due to computer, smartphone and tablet viewing via services like Hulu, Amazon and Netflix, television and movie viewing is higher. What This Means For Marketers: Incorporate television advertising into your overall marketing plans where appropriate. 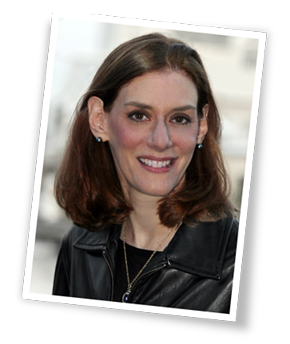 This is particularly important for products that require a mass audience. Actionable Marketing Tip: Integrate an easy-to-remember social media connection between your television advertising (or content) and your social media community. Use hashtags and apps to get your audience engaged on another screen. Radio has declined since 2010. With alternatives like iTunes, Pandora and Spotify and a growing legion of podcasters, it’s a wonder it’s not disappearing. This may be attributable to drive time and older cars. Print media (newspapers and magazine) is disappearing. If they’re part of your revenue stream and/or advertising plans, start testing new options NOW!!! Consumers utilize gaming consoles’ multi-functionality according to Deloitte. 26% use their console to watch online content. What This Means For Marketers: Consumers will use their devices to meet their needs. Take the time to determine which devices your key demographic uses and what type of content they use on it. Actionable Marketing Tip: Create content that’s device agnostic. Ensure that your audience can both view and engage with it on the device of their choice on their timetable. 37% of US consumers now own a laptop, smartphone and tablet (up 42% from 2013) according to Deloitte’s March 2014″Digital Democracy Survey”. Personal technology is no longer just a men’s world; 45% of these multi-device owners are women. US consumers no longer focus solely on one device or piece of content. 86% of US consumers multitask while watching TV; most on unrelated topics. Millennials engage in 4 activities on average while watching TV. What This Means For Marketers: Expect that your audience uses a variety of devices and moves between them throughout the day. (Of course, you should verify this with your customers.) Understand what type of content your target market wants and the type of device they turn to for it. Actionable Marketing Tip: Develop content that’s consistent and flows seamlessly from one device or platform to another. 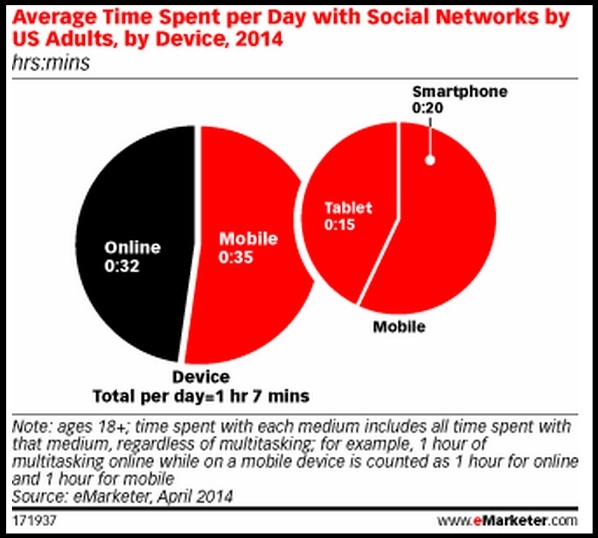 Social media accounts for 1 hour and 7 minutes per day on average based on eMarketer’s projections. Slightly more than half of that interaction occurs on a mobile device. Expect that figure to continue to increase. 54% of US consumers check social networks daily, some do so much as 10 times or more a day according to Deloitte. What This Means For Marketers: Be on social media where your target audience is. Determine which platforms they frequent and the type of content needed to engage them and drive them to purchase. Ensure your content marketing is social media-friendly so that it renders well on key sites like Facebook, LinkedIn, Pinterest and Google+. 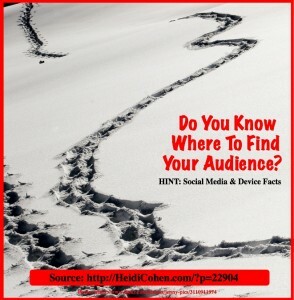 Test and measure your social media content to improve its effectiveness. Incorporate a social media call-to-action to drive leads. As new devices and platforms emerge and evolve, consumers continue to expand and adopt them to meet their personal needs, not yours. To be present and findable when they seek your content and engagement, understand how they use different devices and platforms as well as what they seek from your content. What other media, social media and content consumption trends do you see emerging? Tags Actionable Marketing Tip, Chart, Deloitte, eMarketer, Mark W. Schaefer, Research. Bookmark the permalink. 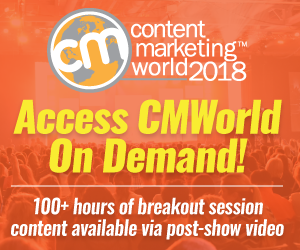 ← Why You Need Up-cycled Content Marketing Now!